Visit one of the northernmost inhabited areas in the world and experience amazing scenery and unique winter activities on this short but exciting tour. Spend a night in the magical Snow Hotel, dine on traditional cuisine, cruise along the famous fjords, try your hand at dog-sledding and — if conditions are right — be dazzled by the northern lights! Self-guided tour, with planned activities. Welcome to Norway! For an easy and comfortable way to get from Oslo-Gardermoen Airport to your hotel in central Oslo, we are happy to arrange a private transfer for you. If you arrive early we suggest buying an Oslo Pass for free travel on all public transit along with free admission to over 30 museums and attractions plus special offers on entertainment, restaurants, shops and more. The pass can be purchased at tourist information centres or at most hotels and major attractions in the city centre. Today you'll fly to Tromsø, a small but bustling city with a cosmopolitan vibe and plenty of natural beauty. After settling into your hotel, you have most of the day to explore your surroundings at your leisure. 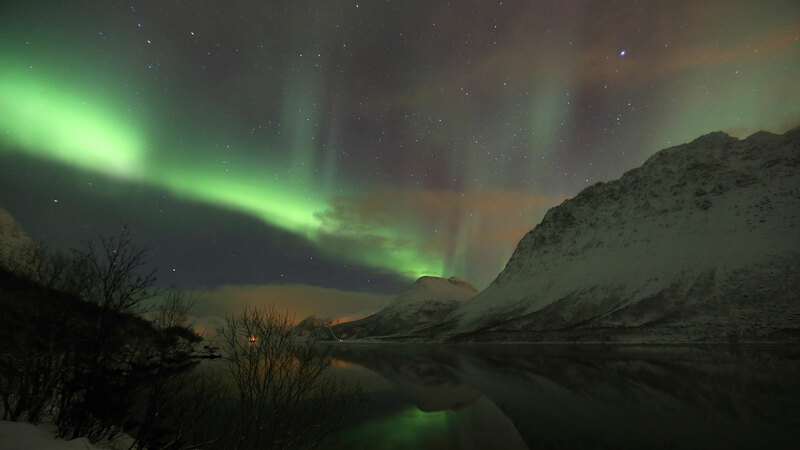 Later in the evening after enjoying dinner in the city, get ready to head out into the countryside for a chance to see the northern lights dancing in the night sky! This guided coach tour also gives you a taste of the local culture as your guide will tell you about the folklore and customs of the area. Spend the night at a hotel in Tromsø. Note: The northern lights (aurora borealis) are a natural phenomenon and sightings cannot be guaranteed. Explore Tromsø at your leisure today. 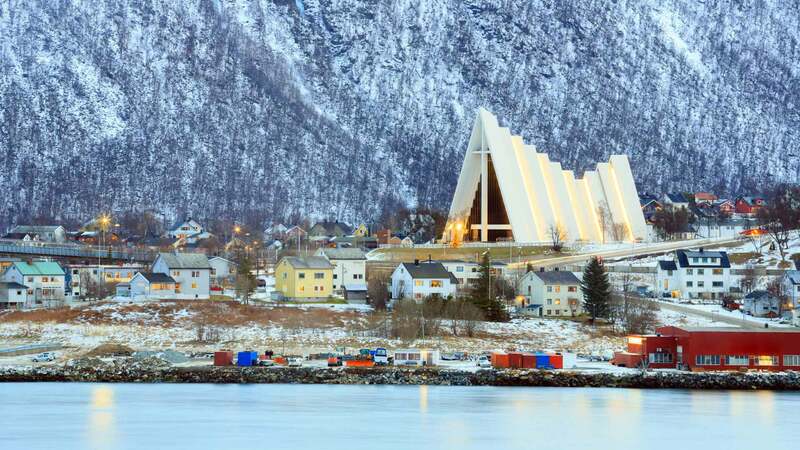 Notable city attractions include the Polar Museum, the Art Museum of Northern Norway and the Arctic Cathedral. For a fantastic bird’s eye view over the city, you can take a ride up the Fjellheisen cable car to Mt. Storsteinen (421 m / 1382 ft.). 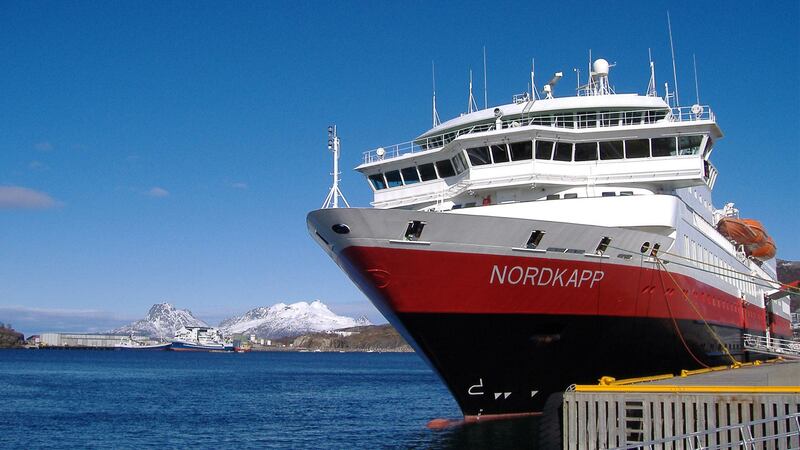 For the next leg of your journey, board the Hurtigruten ship at 18:30 for a cruise to Kirkenes. Sailing along the fjord-studded coastline, this voyage offers incredible views of Norway’s most famous landscapes along with on-board entertainment, gourmet dining and other convenient amenities. For a better view of the scenery, you may wish to bring along a pair of binoculars. Spend the night on board the ship in a cabin with private facilities. Today the ship makes a stop at the famous North Cape (Nordkapp). Situated at 71° north, this area is well known for its beautiful landscapes and wildlife sighting opportunities. Here you will also have a bit of free time to explore the charming seaside town of Honningsvåg. Spend another night on board the cruise ship. At 9:00 the ship arrives at Kirkenes, located about 400 km (240 miles) above the Arctic Circle in northern Norway. With just over 3,000 inhabitants, including the native Sami people, this charming town offers a range of unique attractions and winter activities. 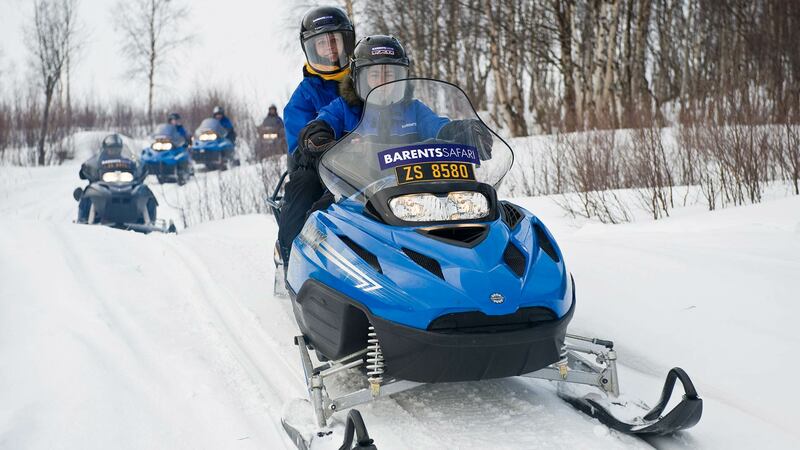 After being transferred to the Snow Hotel, you’ll head out at 13:00 for a 4-hour snowmobile safari. First you'll be taken to an old farmhouse to get outfitted in warm outerwear and given a lesson on how to operate your snowmobile. Then you'll follow your guide out into the frozen landscapes, with some breaks for photographs along the way. As you will be sharing the sled, you will get to take turns driving. This excursion also includes a small picnic. In the afternoon, it's time to check in to the one-and-only Snow Hotel. There you will enjoy a drink at the Snow Bar and feast on a 3-course meal by the fireplace at the Høyloftet Restaurant before preparing for an amazing night in your special suite made of snow and ice! 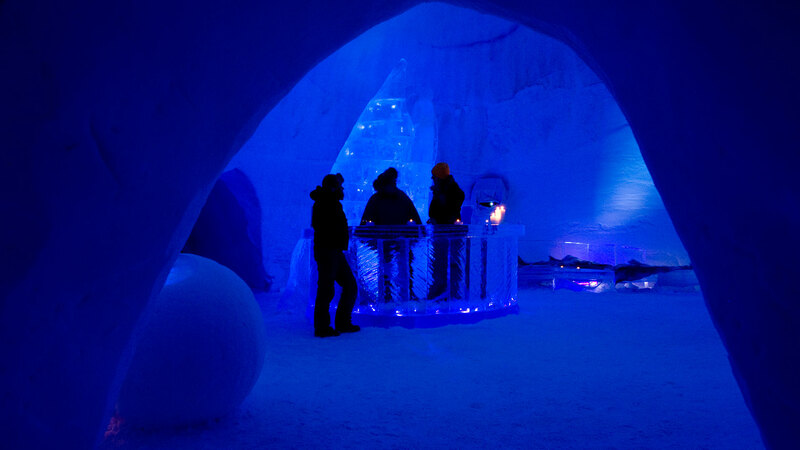 Note: We will provide additional information regarding your overnight at the Snow Hotel, such as details about the facilities, what type of clothing to bring, what is provided by the hotel, etc. Spend the morning warming up in the Snow Hotel’s sauna and enjoying a hearty breakfast. Then you will have a few hours to try out cross-country skiing, snowshoeing and kick-sledging. We also recommend visiting the hotel's friendly reindeer and huskies. After some time out in the snow you can enjoy some warm beverages at the hotel's café. At 13:00 you will experience a true arctic adventure -- a thrilling dog sledding ride! 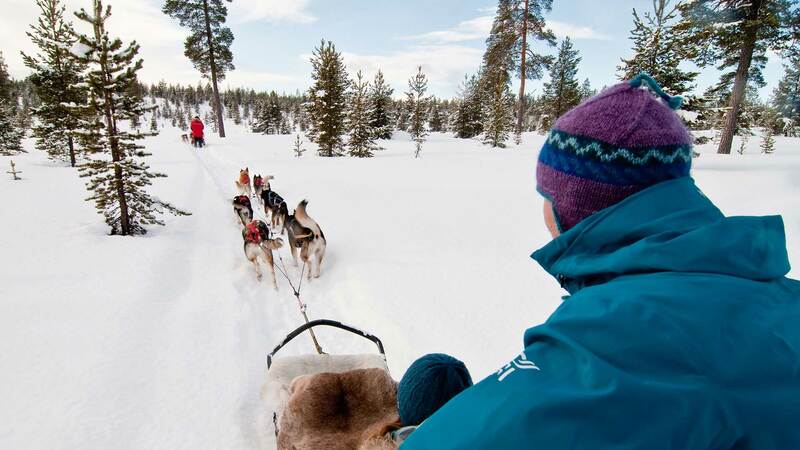 This activity includes a basic instruction on how to “mush”, or drive a dog sled, and then you'll get to drive with your team of huskies over the snowy trails, following your guide. Today you'll fly from Kirkenes Airport back to Oslo-Gardermoen Airport, where you will connect to your flight home. Note: if you do not have enough time between flights, an additional night in Oslo can be added to your package. Contact us for details. After doing a lot of searching and reading online through various tour companies this was by far the most complete with the most combination of activities that I wanted. Normally, I book everything on my own to try and save money where I can, but having the logistics and bookings handled by someone else was a big relief given such a huge schedule and amount of ground to be covered. Communication was very good, all questions answered and I was taken care of very well. Tried my hand at the photo of the month contest offered and was lucky enough to win it. Very cool experience and very happy with everything. Would definitely recommend to others and be ready to book more adventures for myself when the time comes. Thank you! Fantastic experience for a family of 4 - the girls enjoyed it very much. The weather was great and we saw so many amazing things including the Northern lights :) We all loved it - thanks for arranging! The whole tour was an experience that cannot be faulted. Thank you. Helena was one of the best travel consultants I have ever worked with. She quickly answered all questions and was a delight to work with! Due to fluctuating vacancy aboard the cruise portion of this tour, we advise you to contact us to confirm availability on your desired travel dates before booking other components of your travels (e.g. flights).